Disclosure: I was sent a screener copy from the vendor in exchange for an honest review. All views shared are mine and mine alone. When the girls aren't reading the wonderful collection of Arthur and D.W. books we have collected over the years from picking up at library book sales and at flea markets, they are enjoying the handful of Arthur DVDs we own. 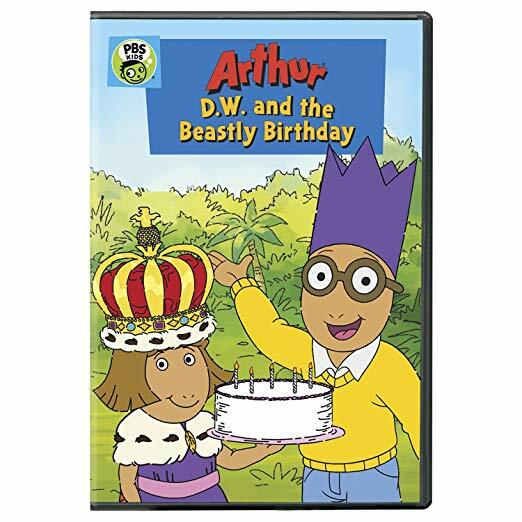 So, when I received the upcoming “ARTHUR: D.W. AND THE BEASTY BIRTHDAY”, which arrives on DVD on August 14th, the other day in the mail, I knew my girls would be excited to watch it with me, especially since we are coming off a month-long celebration of my oldest daughter's 8th birthday. If celebrating my daughter's birthday the entire month of July wasn't enough -- we put and kept decorations up all month, make weekly cupcakes and desserts to add a candle to blow out, and day trips and countdown calendar to her birthday -- we now got to celebrate both Arthur and D.W.'s birthday in this 2-story DVD. I see this DVD being a must see when the girls' birthday month celebrations roll around. They really got into the two stories and love Arthur and D.W., so it was a win-win. "Time to put on your party hats and dancing shoes - D.W. is turning five! When her birthday doesn't go as planned, D.W. runs away to the magical island of Ukubonga. Meanwhile, Arthur has skipped her birthday party to go on a school trip to the planetarium - but instead of transporting him into outer space, it transports him 4 years into the future! This is one party you don't want to miss." I love the Arthur series. So well drawn and great stories. My grandsons love watching Arthur. They would love this. Arthur has always been a big hit around here.